In the spirit of Sundays–the day in which I try to read more than I write–I thought I’d share some of my favorite blog posts from this week. I try to find fun posts that will inspire us to keep our bags packed, take journeys we might be afraid to take, and give us a little hop in our step for the week to come. If you’ve got a post you think I should share, please email me with the link and I’ll consider it for next Sunday’s round-up! My friend and colleague Shannon at Camera & Carry-On put this one together. It’s a round-up of the quirkiest, oddest, and sometimes most practical!, things we stuff in our travel bags. I’m amazed at the kinds of responses she got–from portable wireless chargers to the trusted notebook and pen to avocadoes and cross-stitch patterns, there is nothing we women don’t put in our bags. You’ll find me in here, dishing on the one thing I absolutely can’t leave home without, no matter what. 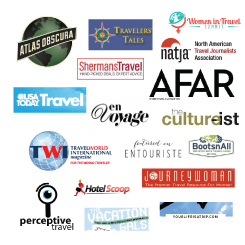 Tinggly just took on the massive task of interviewing over 50 travel writers and bloggers to find out what the most important lesson is that they’ve learned while traveling. You’ll find some unusual responses here (and many of the usual suspects highlighting personal transformation, global sensitivity, and a growth in self-confidence), revealing to me that there really is no one-size-fits-all reason why people travel. I met this infectious woman in Boston two weeks ago at the Women in Travel Summit 2015, and I must admit: I fell in love with her immediately. Catrice has the kind of personality that really does shine–in a matter of minutes, she had the whole audience smiling, owning their own “brands” (see the post I’m about to include to see what she means by “brand”–it’s not what you think), and getting up and stating what kind of flavor they are (from fruity to sweet to bitter to spicy, there was no lack of culinary variety in that room!). The one I’m including in my round-up this week is one of her newest posts, which I stumbled upon after going to her site to look for some much-needed, after-conference-letdown inspiration. It’s all about doing that important internal work before putting ourselves out into the world. Great reminder. Thanks so much for the shout out! I love it and appreciate you too! Our tine in Boston was a magical moment for sure. I’m so thrilled you found value in my branding session and I hope you take what you’ve learned to totally, unapologetically rock the brand of YOU. Thanks for your love and support. Catrice, you’re so welcome! Seriously, I needed a good dose of confidence (it’s something I struggle SO much with, despite my own successes in life). Thanks for the awesome reminders!